America's transgender community experiences some of the highest rates of discrimination, violence, and poverty in the country. So how has Fox News managed to portray this marginalized and vulnerable community as threatening, greedy, and deserving of mistreatment? Despite the progress that's been made in the fight for transgender equality and visibility, transgender people continue to face astronomical rates of harassment and discrimination at work, in school, in public places, and even from law enforcement. Trans people are often refused medical care, fired from their jobs, denied housing, and even evicted from their homes because of their gender identity. Trans people are also often targeted by physical violence. Just last month, Tamara Dominquez became the 17th documented trans woman of color to be murdered in 2015. This year's unprecedented streak of homicides of transgender women has gotten the attention of major national news outlets, including The New York Times and Time magazine. On ABC's Good Morning America, transgender actress Laverne Cox declared a "state of emergency" in the transgender community. But over the past few years, Fox News has cast the transgender community as one of its favorite villians, peddling bogus horror stories, touting fake medical "experts," and actively mocking trans people to suggest that they deserve to be mistreated. The primary way Fox News has demonized the trans community is by depicting the fight for trans equality as dangerous, threatening, and unnecessary. Whether it be local non-discrimination ordinances or trans-inclusive school policies, Fox News uses scare tactics to attack even basic protections for trans people while ignoring or downplaying the reality of anti-trans discrimination. The network's favorite horror story about transgender equality is the myth that sexual predators will exploit non-discrimination protections to sneak into women's bathrooms. The myth has been thoroughly debunked, but Fox repeatedly peddles the talking point when covering gender identity protections -- going as far as promoting entirely fabricated stories about transgender predators. But Fox's fearmongering goes beyond lying about legal protections for trans people -- the network has attacked transgender television characters (kids will experiment with homosexuality! ), school lessons on gender diversity (we're falling behind in math and science! ), and even the decision by Macy's department store to welcome transgender customers (a threat to religious freedom!). All the while, Fox personalities insist that these protections aren't necessary because discrimination and bullying against trans people "is not a big problem." These scare tactics aren't just silly, they're strategic -- aimed at pulling the public's focus away from the very real discrimination experienced by transgender people. One study found that 70 percent of transgender people had been denied access to, verbally harassed, or physically assaulted in public restrooms. Similarly, another study found that 78 percent of transgender or gender non-conforming kids grades K-12 have experienced harassment at school, with 15 percent experiencing such severe harassment in K-12 or higher education that they dropped out. The same reason explains why Fox has yet to mention the unprecedented number of murders of trans women of color this year. Acknowledging evidence of actual discrimination and violence against trans people would make the network's bogus horror stories seem ridiculous by comparison. Professional medical organizations agree that transgender people are real, normal, and deserve respect. To get around this consensus, Fox enlists its own set of junk scientists who spout fringe, anti-trans "expert" opinions about trans people. The network's favorite anti-trans pop psychologist is Dr. Keith Ablow, a member of Fox's "Medical A-Team" who frequently commentates on the network's trans focused segments. Ablow has opined that "there's no such thing as being transgender," and declared he'd prescribe a transgender child "anti-psychotic" medication. In 2011, he asserted that Chaz Bono was suffering a "psychotic delusion" and cautioned parents that simply watching Bono perform as a contestant on Dancing With The Stars could turn their children transgender. Ablow's "expert" medical opinion is wildly out of step with mainstream medical organizations, including the American Psychiatric Association and American Psychological Association, both of which recognize the importance of supporting transgender people and providing them with adequate health care. When not relying on the wildly inaccurate statements of pseudoscientists like Ablow, Fox personalities dispense their own misguided ideas about transgender people. Bill O'Reilly has used his perch to dispense bigoted and dangerous advice for parents raising transgender children, saying he wouldn't allow or support his own child transitioning, and that parents who do so are "crazy" and might be "guilty of child abuse." Actually allowing a transgender person to talk about their experiences on-air would undermine Fox's ability to demonize the transgender community as threatening and extreme. That's likely why transgender people almost never appear on Fox's airwaves. While Fox regularly invites representatives from anti-LGBT hate groups to criticize basic efforts to protect transgender people, a recent Media Matters study found that the network failed to host even a single transgender person as a guest in the 27 segments it did on about transgender-related issues over the course of nine months. Fox excludes transgender people from their trans coverage so that the network can continue its dehumanizing, inaccurate treatment of them without acknowledging the damage it causes. Dehumanizing an entire group of people using scare tactics and mockery only works if those people are denied a chance to defend themselves and tell their stories. Step Four: "They Deserve To Be Mistreated"
Instead of recognizing that the moral failure lies in society's unwillingness to embrace different gender identities and expressions, society blames transgender and gender nonconforming people for bringing the discrimination and violence on themselves. 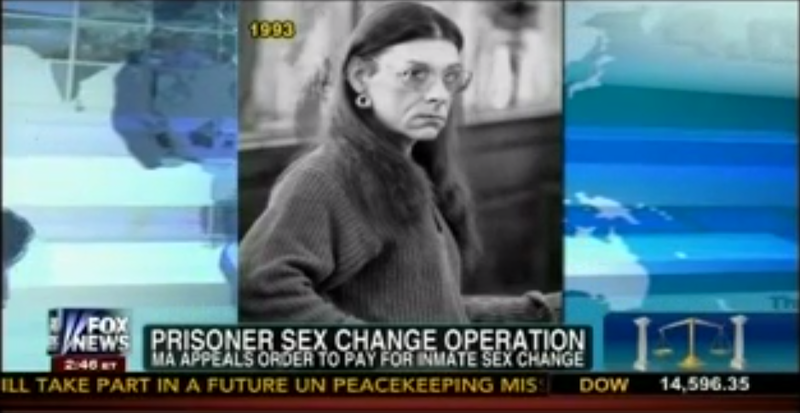 Fox routinely tells stories about transgender people through the lens of criminality -- focusing on transgender prisoners and lawbreakers to suggest that trans people don't actually deserve dignity or equal treatment. Fox, for example, incessantly mocked and misgendered Chelsea Manning, who is serving 35 years in prison for leaking classified military and diplomatic documents to WikiLeaks. Fox personalities scoffed at the idea of providing Manning with transgender health care in prison, describing it as "special treatment." Anchor Gregg Jarret defended his decision to misgender Manning by boasting, "I don't do what Bradley Manning wants me to do." Fox also tracks down and highlights stories about transgender immigrants to disparage the transgender community. A Fox & Friends "Entitlement Nation" segment on hormone therapy for detained immigrants called the treatment "outrageous," and proposed that the best way to treat undocumented trans immigrants would be to give them "a pair of Joe Arpaio's pink boxers as we send them back to their country." Whether it's playing Aerosmith's "Dude (Looks Like A Lady)," laughing at a transgender prisoner's appearance, joking about "the one part" of Chaz Bono's body "that hasn't been operated on," mocking transgender health insurance coverage, or calling Chelsea Manning "Bradleen," Fox News routinely engages in transphobic name calling and mockery in front of millions of viewers. Experts have criticized Fox for its treatment of the transgender community, warning that it could contribute to transphobic violence and discrimination. Yet Fox continues to make derogatory and dehumanizing comments about transgender people that add nothing to the news, but go far towards legitimizing anti-trans discrimination. When Fox makes flippant jokes at trans people's expense, it assures audiences that transphobia is acceptable -- both on and off the network. Fox's dehumanizing treatment of the transgender community is emblematic of the network's broader victimization complex. While Fox works to cast transgender people as a threat to taxpayers and bathroom-goers, the network simultaneously labels Christians, Christmas, religious freedom, and white men as under attack. That victim complex has long been Fox's MO, but when it makes transgender people the enemy, it becomes a systematic effort by cable news' most influential network to ostracize and dehumanize one of the country's most at-risk populations. This post originally described Michelle Kosilek as an inmate in Virginia. She is in Massachusetts. Copyright © 2010 Equality Matters. All rights reserved.